Turkey is grappling with Kurdish troubles spearheaded by the outlawed Kurdistan Workers’ Party (PKK) both on its volatile 900-kilometer-long border with Syria and at home. to hassle Turkey and act as a buffer force should Ankara decide to intervene, or carve a buffer zone, in Syria. Turkish intelligence reports say up to 2,000 PKK militiamen -- many of them previously trained in Kandil, a major PKK camp in northern Iraq -- are already deployed in Syrian Kurdish areas near the borders with Turkey. PKK acting leader Murat Karayilan this week told the Europe-based Firat News Agency, which is close to the PKK, that Turkey was preparing the groundwork for an intrusion in Syria. "The Turkish state is planning an intervention against our people," he said. "Let me state clearly: if the Turkish state intervenes against our people in western Kurdistan, all of Kurdistan will turn into a war zone." Doubling the size of its security forces along the border with Syria. Urging the opposition Syrian National Council (SNC) to co-opt Syria’s Kurdish groups, offering them a clear vision for the post-Assad era. Enlisting the help of Massoud Barzani, president of the Iraqi Kurdistan Region, in countering the threat of a Syria-PKK alliance. 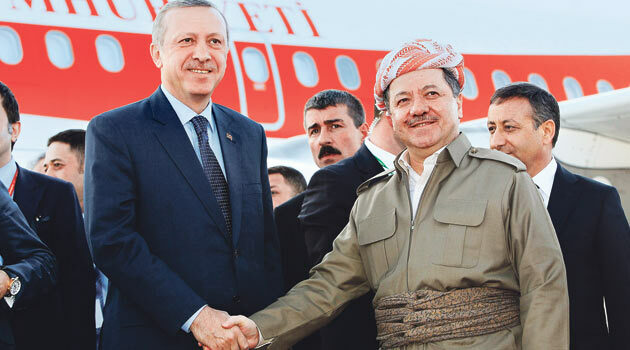 At the same time, Prime Minister Recep Tayyip Erdoğan’s government is said to have formulated a new Kurdish strategy. Mohammad Noureddine, perhaps the most authoritative writer on Turkish affairs in the Arab press, today lists nine of the strategy items in a think piece for the Baghdad daily al-Sabah. Use no channel outside civil politics in trying to solve the Kurdish problem. Exclude as interlocutors both Abdullah Öcalan, who is serving life on Imrali Island, in the Sea of Marmara, and PKK leaders based in Europe or Qandil Mountain. Help Kurdish citizens in the southeast withstand pressure from the PKK and its purported urban wing known as the Kurdistan Communities Union (KCK). Address the Kurdish people directly, without intermediaries. Seek solutions within the halls of the Turkish parliament. Talks would only be with duly elected Kurdish legislators. Sustain military operations against the PKK. Rule out any negotiations with the PKK before it disarms and hands its weapons to the government. Exclude from the new constitution any reference to a Kurdish identity or autonomy arrangement. The new constitution would simply uphold human rights and citizens’ equality before the law. Empower local authorities, with the proviso that governance will be based on state laws.